Ornamental value: Ponderosa pine has a lush green color and pleasant odor that makes it popular for ornamental plantings. It has been planted, sometimes out of its natural range, because of its aesthetic qualities. 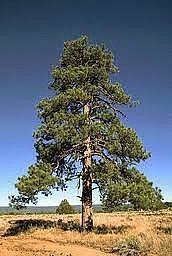 Ponderosa pine is used as borders of forested highways, but is not planted within the right-of-way. The large stature of the tree limits its use to open spaces. Pine Family (Pinaceae). Ponderosa pine is a large tree that lives 300 to 600 years and reaches heights of 30 to 50 m tall and 0.6 to 1.3 m in diameter. The oldest trees can exceed 70 m in height and 2 m in diameter. The bottom one-half of the straight trunk is typically without branches. The crown of ponderosa pine is broadly conical to round-shaped. The bark is characteristically orange-brown with a scaly plate-like appearance. Twigs are stout, up to 2 cm think, orange-brown, and rough. Needles are 12 to 28 cm long, thin and pointed with toothed edges, occur in bundles of three, and give a tufted appearance to the twig. Buds are up to 2 cm long, 1 cm wide, red-brown with white-fringed scale margins. Male cones are orange or yellow and are located in small clusters near the tips of the branches. The female cone is oval, woody, 8 to 15 cm long, with a small prickle at the tip of each scale. Flowering occurs from April to June of the first year, and cones mature and shed winged seeds in August and September of the second year.